My version of Oria Mutton curry is much better than I had at my friend’s house. This Mutton curry dish tastes just like Odisha’s famous NANA DHABA’S Mutton curry dish. My friend told me this. According to her, it looks also the same. I love the dish and the taste of the dish is quite Impressive. If you make the dish at least once for any dinner or lunch, I am sure no one will be disappointed by its tastes. What Part of The Mutton Meat Or Goat meat you should for this Oriya Mutton Curry Recipe? I would always suggest you, to use goat meat with bone for this Curry dish. I find, with bone mutton adds more flavor to the dish. The leg portion of the mutton meat with bone is the best part to make any Mutton curry dish. The same is applicable here also. I would also recommend using a little bit of fatty mutton for this curry recipe. Fat intact with the bony mutton meat not only looks good but also taste awesome after cooking. And one thing always keeps in mind that you must use medium pieces of mutton for this mutton curry otherwise the meat will be shrink after cooking and won’t look good after cooking. Why should you use Unpeeled Potatoes in this mutton curry dish? In India, people never use unpeeled potatoes in their curry dish. But I saw in Odisha people use unpeeled vegetables in their curry dishes. Especially they don’t peel pumpkins and potatoes. I came to know from my Oriya friend that there is a reason behind using unpeeled vegetables. She told me that according to people, peeling a vegetable is a disrespect to GOD OF FOOD. So they never waste a big part of food or vegetables by peeling the vegetables. They just cut vegetables and use them in their everyday dishes. What kind of Potatoes can you use for this Oriya Mutton Curry Recipe? If You are an Indian you can use normal potatoes available in the local markets. Just cut the potatoes from the middle and use it in the mutton curry. But IF YOU ARE FROM OUTSIDE OF INDIA use Russet Potatoes for this mutton curry which is perfect for the dish. whatever kind of potatoes you are using in any vegetable curry MY SUGGESTION is always properly clean the potatoes if you go for an unpeeled one. Cleaning a potato is very important before coking because the potato is a root vegetable and outside the peel, it’s always coated with mud. Can you use Lamb meat or Beef for this same Oriya Mutton Curry Recipe? Is the dish HOT and Spicy in TASTE? Though many spices are used to make this Oriya Mutton curry But the dish is not HOT in taste at all. My kid just loves to eat this curry with white steamed rice. If my kid can eat this I am sure anyone can eat this. What to serve with this curry? I would recommend you to serve the Oriya mutton curry recipe always with plain steamed white rice. 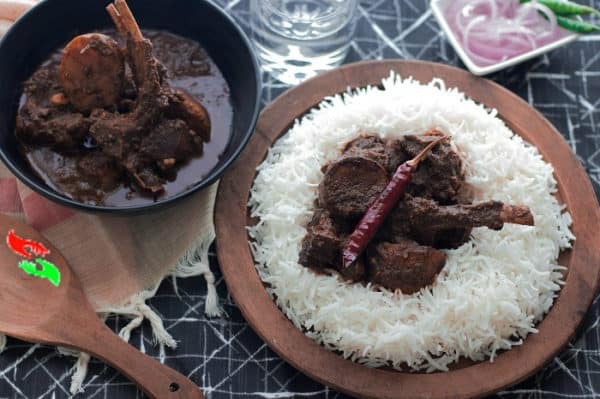 Any kind of steamed white rice just tastes perfect with this mutton curry. I find this curry dish never taste good with Roti, Chapati, Naan Roti or Paratha or any Bread or Flatbreads. Have any Recipe Request or any suggestion please let me know in the comment box. Your every comment is valuable to me. And it inspires me to cook and share more delicious recipes. Take a big cooking pot. Make the pot heat enough and put oil into it and sear all the goat meat in the hot oil. Now fry all the unpeeled potatoes until they change the color to slightly brown. Remove the potatoes from the pot after all done. Put Bengali Five spice Panch Phoron, Whole dry Red chili, Bay leaves Into the rest of the oil. Fry all the spices in the Medium heat for just 1 or 2 seconds. Just after one or two seconds add finely chopped onion into it and fry until they are light brown in color. At this point add ginger- garlic paste or chopped, turmeric powder, Sweet paprika powder, and Speical Garma masala (2 tsp Full) into the pot. Mix well with fried onions in the pot. Cook all the spices for 2-3 minutes then add all the meat pieces and potatoes. Mix the spices with potatoes and meat pieces and then add hot boiling water to it. Now cover the pot with a lid and low the gas flame as much as you can for slow cooking. IF YOU HAVE A SLOW COOKER BETTER TO USE THAT FOR THIS REIPE. WITHOUT SLOW COOKER you should cook the meat for at least 45 minutes in low flame and after 45 minutes add rest of the special garam masala and sugar salt with the curry. Mix well and close the pot with the same lid and cook the curry in the same gas flame for another 5 minutes. After 5 minutes turn off the gas and serve the dish with hot steamed white Rice.